Lake Shelbyville is a natural for white bass. White bass thrive in large, open-water impoundments containing an abundance of shad, their favorite forage fish. This 11,000-plus acre impoundment is located in Shelby and Moultrie counties in central Illinois about 4-hours south of Chicago. It is a hill-land impoundment with depths exceeding 60-feet, long wooded coves and some of the most scenic water in the state. From mid-April through June the white bass of Lake Shelbyville are a bread-and-butter fish for anglers in search of action. The feisty fish move up out of the main river channel into tributaries to spawn. Normally they hold at the mouths of creeks for some time before heading upstream. As they then concentrate in shallows on the back of Kaskaskia and Okaw rivers. Once upstream one can find them in schools in eddies behind current breaks as such rocks, blow downs, etc. The smallest bass will be on top with the big boys on the bottom of the school. They let the little fish do the hard work of chasing shad and minnows. It seems that everyone who fishes for white bass on this lake has a preference when it comes to lure or bait. Generally the bait fishermen prefer small minnows on a jig. The lure anglers tend to go with small jigging spoons. Others like the 1/8th to 1/4-ounce Road Runners with a tinsel tail or a white curly tail. White seems popular due to the water clarity in early spring. For more dingy water one might try yellow. In April bottom bouncing a jigging spoon is good. The fish are generally gathering along expended points in the water ranging from 5 to 50-feet deep. Later in spring and early in summer anglers cruise the lake watching for shad chased by bass to break the surface. If they break the surface in an area the angler knows they can catch bass beneath the shad with just about any kind of small artificial lure. Jump fishing or angling for moving whites in open water is frustrating as well as exciting. As the marauding schools of white bass corral the shad near the surface they seldom conform to predictable patterns of movement. They may hit the surface for only a few minutes only to vanish from sight and reappear a few hundred yards away. White bass working points are a little easier to stick with. When the surface action disappears once can troll to zero-in on them. Usually small crankbaits, spoon plugs and blade baits can be trolled at about 5 to 6-feet deep to find the fish again. If no action at that depth then move deeper or shallower until you find the fish. 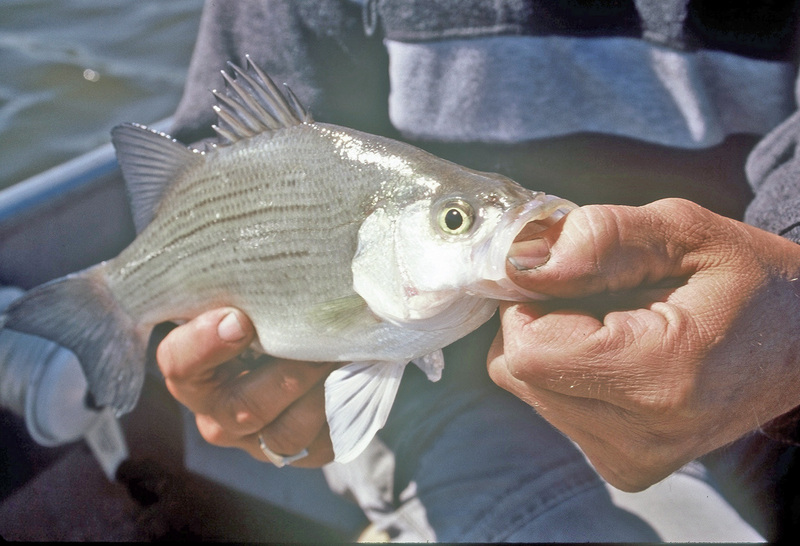 White bass fishing is often good from April right on through the summer and into fall. When all else fails the white bass action will be there for the angler. Fishing for Midwestern trout is usually a little different than in western or eastern waters. This is due to the fact that most Midwestern trout are hatchery raised and often found in ponds as opposed to rivers and streams. Such is the case with Illinois’ catchable trout season which begins in April. With the exception of Devils Kitchen Lake in Williamson County, the local trout are placed in the ponds and small lakes of some 50 locations a week or so prior to the opening. 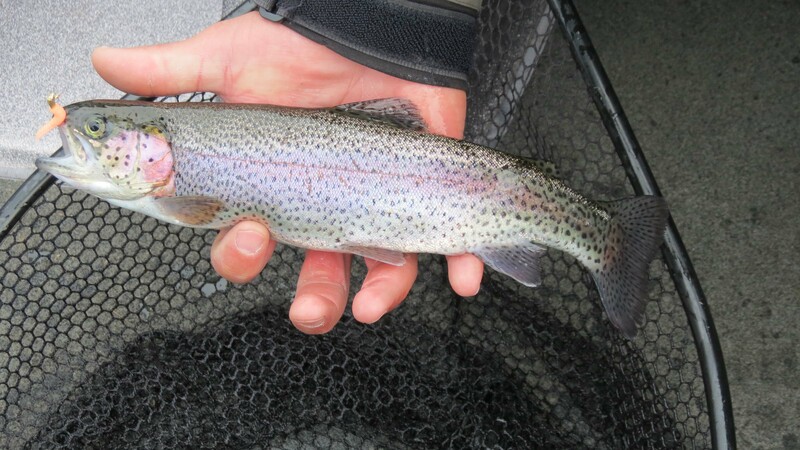 The fish are usually all caught by the arrival of the warm summer temperatures which raise the water temperatures beyond that habitable for trout. Devils Kitchen Lake is a very deep lake and the water does not get as warm allowing the fish to survive. Spin tackle in the main Midwestern choice for trout fishing. Out west and east there is more fly fishing. You want a relatively light rod to match the style of fishing you are doing. Light to medium-light action is best because it is very soft and limber allowing the casting of very small lures. The reason for the preference of the open spinning reel for trout is the use lighter line. It works well with 4 to 6 pound test line. Typically drag is better too. The closed face spinning reel tends to allow light line to bunch up on the reel. It does not cast as well if you get a snag or after you catch a fish. Closed face reels are for use with heavier line and for more basic fishing. Most trout respond to lures of 1 1/2 inch or less. In stained water you might want to use something a little larger. Some anglers like a camo-green line because it does not put off the fish. You can also get away with a little heaver line. You might up-grade to 6 to 8 pound line. You might use the heaver line with a 2 foot leader of the lighter line. Fluorocarbon line in the 2-lb and 3-lb size tends to be brittle. Four pound monofilament line works. For lures you can use anything from micro jigs up. Pink and rainbow trout seem to go together. Red, brown and orange are good colors for brown trout. You can dress a jig by putting a bobber six or eight feet above it. It is not as a strike indicator. But, rather it gives the line additional weight for casting. In clear water a clear bobber is best. If you need to cast a long way you can put some water in the bobber or add split shot. You adjust the bobber according to the water depth you are wanting to fish. If you are getting short strikes because the fish is attacking the feather portion of the jig presentation, trim the tail making the whole presentation shorter and closer to the hook. Using the floating micro-crankbaits you can make them go lower than two or three feet by adding a split shot. Maybe you will want to put a large enough split shot on that the bait to make it actually sink. Let them sink longer to really fish deeper and not as long to go shallower. For larger brown trout try a minnow crankbait. In deeper water you can throw a crankbait that has a larger bill on it. The longer the bill on a hard bodied bait, the deeper it will go. If it is one that suspends, you crank the bait down and then twitch it back. It works in really deep water. Spinners catch more fish than any other class of lure. More people use them. It is basically a piece of metal that goes round and round. It creates a visual flash and a good deal of vibration. Fish will pick up the vibration through the lateral line and will come from a long way away. In clear water the flash is a big advertisement. Spoons with a wide waddle, the wider lure, are good. The width and weight of the spoon will determine what part of the water column you are fishing. A wider spoon works better in the upper part of the column. Buoyant spoons seem to have the kind of waddle preferred by trout. The technique is simply to cast and retrieve it. You can vary the speed of the retrieve or you can cast it and allow the spoon to sink. Simple is good when trout fishing. It is what you are going to do most of the time if you are to be successful. Try natural bait. Trout have an amazing ability to consume large baits when it comes to natural ones. They are little Billy goats. If they are hungry they are going to eat it. They do often prefer only very tiny offerings but it they are hungry they will take almost anything in the tackle box. If you are fishing highly pressured areas use smaller line, smaller presentations, and be a little quieter. In an area with a lot of trout get out your favorite lure and make it work. Dough bait is a big Power Bait that has is not pelletized. Power baits work best on single hooks and dough baits work best on treble hooks. They both can add scent and color. Scented baits add not only a scent for the fish to follow but also cover your human scent. A couple drops of unscented soap will clean unwanted smells from your hands. Just apply rub hands together and rinse in the water. Use anything without perfume in it. In spring with muddy water start fishing with something that has more vibration as a presentation. Use scented lures and worry less about the size of the lure. The bigger the profile the more water moved and the more vibration created. The scent is a bonus. When the water is low use a hook with a piece of nightcrawler on it fish. The blooming of the Dogwood trees signals the crappie spawning period. The rest of the forest is full of dark shafts of wood rising toward the sun. On them are small buds and the beginnings of green leaves. The mantel of green will soon provide shade a plenty. The sighting of the dogwood and red bud blossoms seems to explode on the scene just in time for the crappies to move in to shallows in search of bedding areas. Veteran crappie anglers take to the water with long poles and ultra-light reels spooled with 2-4 pound line. The long poles enable one to dip his offering into the flooded buckbrush where the big ones hide. Spring is a time of rising water levels. Most lakes are watershed or flood control lakes. Jigs are popular offerings by crappie anglers. They are usually tipped with a minnow (known around here as crappie minnows) or some brightly colored plastic lure. White, black and pink are popular colors. Hair jigs or marabou jigs also are popular. One sixteenth or 1/32nd ounce jigs are the size of choice. Remember that crappies are a predator fish that likes to feed on insects and small fish. They relate to structure which conceals them until they can ambush there forage. Do not work your offering too quickly. Slowly work the jig in a bouncing motion to imitate an injured bait fish. Work the offering around any area with wood, rock or concrete structure below the water level. In some areas brush piles attract fish. Wooden stakes driven into the bottom in groups also work well in attracting the crappie. If no structure is visible from the surface, all is not lost. Some people who put out brush piles hide them so as to have the honey hole to themselves and their friends. A boat equipped with fish locators or sonar locates these areas and any fish present. 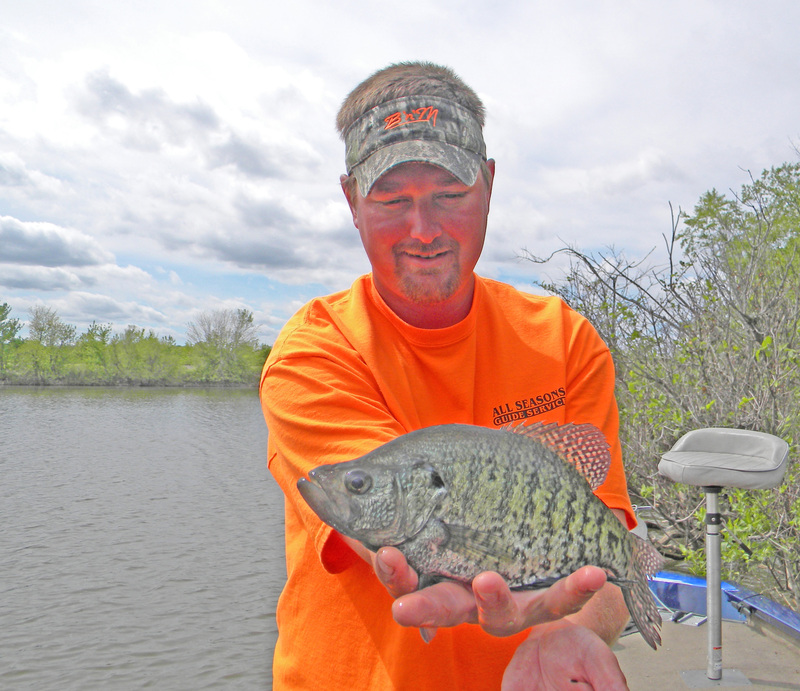 In late spring crappie will first submerged structure more frequently. Early in the spring they tend to stay in more shallow water as the spawning season begins. Early go to the shore and later to the deeper water. If the fish quit biting suddenly move about 2-feet away and try again. Keep that up for a little while. If that does not produce results go back to the original location and follow the same pattern with a different color jig. One old crappie killer technique is to use the scales as an attractant. The angler scales one of the fish already caught and sprinkles the loose scales on the water. He waits a minute or two and then begins working the jig in the same area. 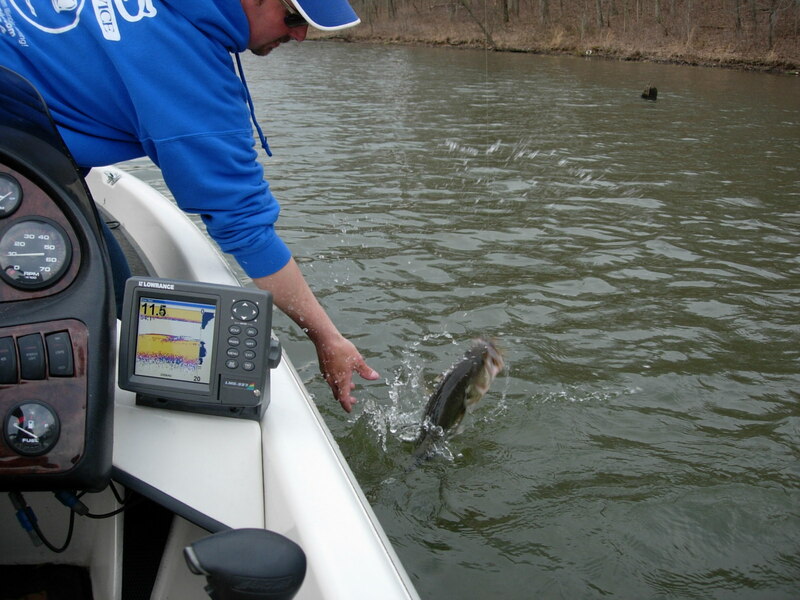 The idea is that the scales simulate a bait fish and stimulate the crappie to begin feeding actively. Three species of “bass” inhabit the tailwaters below the Carlyle Dam. The three are Yellow Bass, Largemouth Bass, and White Bass. The 26,000-acre impoundment that is Carlyle Lake is on Illinois 127 and US 50 at the midway point between Interstate 64 and Interstate 57 in Clinton County. The city of Carlyle is located at the south end of the lake near the dam. The 15-mile long lake is 3.5 miles wide. The deepest part is 40-feet deep. The most popular fishing location for shore anglers is the tailwaters area below the dam. Often anglers are almost elbow to elbow along the shoreline on both sides. The least fishing pressure comes during the week. Weekends are busy virtually all year. With a regular stocking of fingerlings of largemouth, a number of very successful bass tournaments have returned to the waterway. It is host to the High School State Championships in the spring. Although the best bass fishing is in the oxbow lakes, adjacent to the river current, largemouth bass are in the entire waterway. They like the abundant woody cover to avoid the current. Local anglers report commonly catching fish in the 3 to 5 pound class. Habitat development by the Illinois Department of Natural Resources has brought the smallmouth back from the brink of elimination. The best locations to find them are north of the Carlyle area but some fish are finding their way down to the tailwaters below Carlyle Dam. Fish in the 2-4 pound range are usually in areas with rock or gravel bottoms. Look for them in the slower water. The lake areas are usually home for the white bass. But in the spring the greatest numbers of fish make spawning runs up river from below the dam until their path is blocked by it. Anglers often catch fish in the 10 to 15 inch class. Look for them in the gravel bottom areas with the swift running water of the tailwaters. 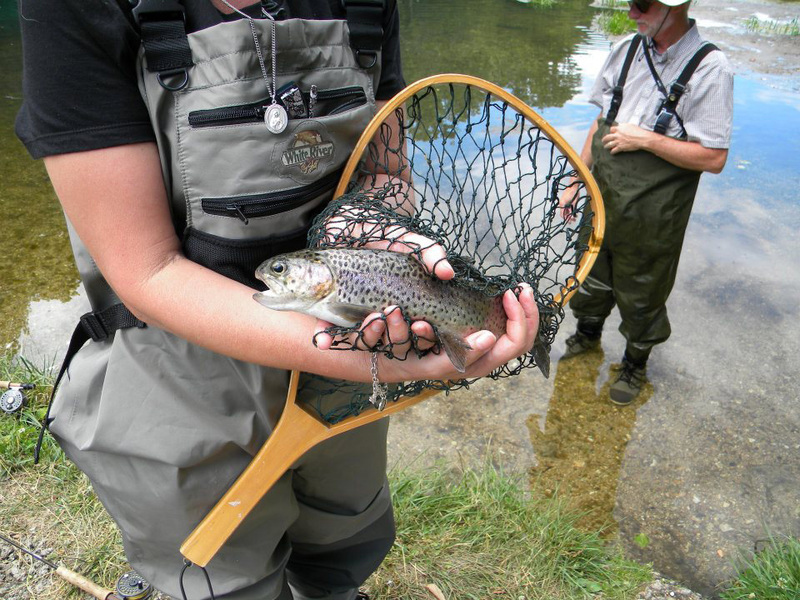 Classic trout fishermen typically throw very small flys. The reason they can do it is that trout are sight feeders and their vision is very acute. Conditions dictate that fisherman to use certain flys. Just because anglers prefer to use dry flys because it is more fun it is not the only option. Their eyes are mid-range. That means they are comfortable looking up for food as well as down making them multi-directional feeders. Trout in the wild prefer cold moving water over a rocky bottom. They can survive in the still water of a pond but on a more limited basis. The ideal water temperature for trout is in the 40 to 55-degree range. This can vary by sub-species. On rivers where water levels change during the day, they survive through adaptation. When the current is fast, they will be near the edges of the river system. As water levels lower and current decreases they will go more toward the middle or they will range the river system. Their relating to structure is to conserve energy and preserve calories. A trout has a lateral line like all fish. He responds to movement, vibration and sound. The lateral line allows him to pinpoint a direction from which those things emanate. He then moves toward that sound and then uses sight to zero in on it. Trout have tiny scales allowing them to love in a moving water environment. This coupled with their slime coat allows them to go nose into the current with less energy. It also makes them very slippery to handle while landing. Most popular are rainbow trout and brown trout. Rainbow is the prominent stocking fish. That is because they are the easiest trout to grow. They take to the food, they take to the overcrowding and they take the polluted water a little bit better than a brown trout. When you remove a trout from a hatchery and place it in any body of water there are two things to remember. Where did that truck back up to? And what do you have a lot of in your tackle box? For about 3 days trout will be stupid. They spend some time where they are released trying to get acclimated. They will bite anything until accustomed to the habitat. They do not have the instincts and intuition of a wild trout because they have never had to do anything for their meals. In most instances most manmade lakes have an area where there may be a little bit of a spring. When the builders dug down perhaps they found a little spring trickle. If the fish find that area they hang out there and feed to survive through the summer. It might only be 2% or less of the total water available. Brown trout are more likely to be in cooler water and in moving water. They will be in habitat that has more structure. They are thinking ambush. They think prey. They are thinking what to do for the next meal. Rainbows are just happy to be there and will just swim around. An often over looked part of fishing is the noise factor. Whether on shore, in a boat or wading, sound plays an important part of fishing success. Most of us have no realization of the amount of fish we scare off. All fish respond to noise. It travels five times faster underwater as above. Fish received high frequency sounds up to 30 feet via their inner ear. The low frequency sounds are processed by the lateral line and are most often heard in distances of five to 10 feet. The average fish hears in the range of from 30 cycles per second (cps) up to 2,000 while the average person hears in a range of 20 to 20,000 cps. The average AM radio station broadcast in 10,000 cps. New motors have been developed that reduce engine noise, but sound is till a problem in spooking fish. Fish are accustomed to the noise of their surroundings, such as waves lapping up on the shore. But, alien sounds will cause them to scurry for other parts of the lake. Even bluegill, catfish or deep feeding walleye move away from foreign sounds. Pro angler Brent Chapman, a Yamaha pro angler, has several suggestions for sound reduction which apply to all species. Chapman recommends and uses rubber-soled shoes when fishing. He also fishes from a carpeted boat. The layer of carpet on the floor of a boat helps a great deal. But, Chapman is quick to point out that one with thin pile is best. He does not like to spend a lot of time unhooking fouled hooks. It is fishing down time, something a pro angler hates. Loose items should be kept in a storage compartment or secured with elastic straps or Velcro. A lure or sinker dropped on the bottom of the boat will send warning notice to any game fish lurking nearby with the result being that flee the area. If you use oars, then plastic tubing around the oarlock pin will dampen sound. What if one is renting a boat? 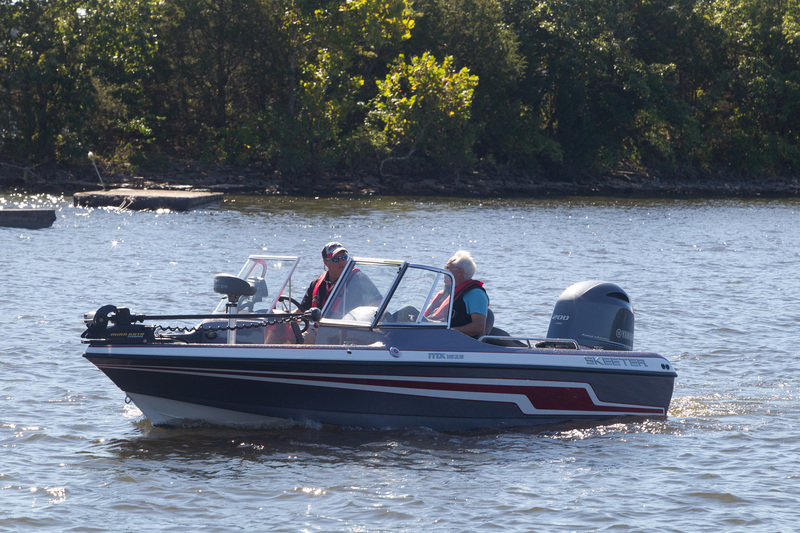 There are things you can do with rented boats to help deaden any sound. Purchase a piece of carpet or two at a local carpet outlet. It should not be expensive since all you need is a piece about two feet by three feet to spread on the bottom of the boat under your feet. Then if you have to stand or move a little, the sound can be absorbed by the carpet. If you arrive at you destination and have forgotten you carpet pieces, all is not lost. Take the floor mats out of your vehicle and use them in the same manner. The noisiest of boats is the aluminum hulled craft. Sound travels much better through aluminum than through fiberglass. Anglers entering a shallow cove on a calm morning need to cut the engine and let the boat glide into casting distance of the area one wants to fish. Fish that are feeding are the most nervous in clear, shallow water. Most anglers think that their trolling motor substitutes for the gliding in on fish. Not so. Electronic trolling motors can be heard too. The electric trolling motor sets up a drone that can upset a nervous bass. Remember when fishing, silence is golden. Largemouth bass are a dominant species in Illinois. They are popular with anglers due to their fighting spirit and widespread distribution. Both stocking programs and natural reproduction contribute to their being available in virtually all areas of the Land of Lincoln. Three factors combine to create the bass situation we have in Illinois. They are improved water quality/habitat, sensible regulation, and catch and release. 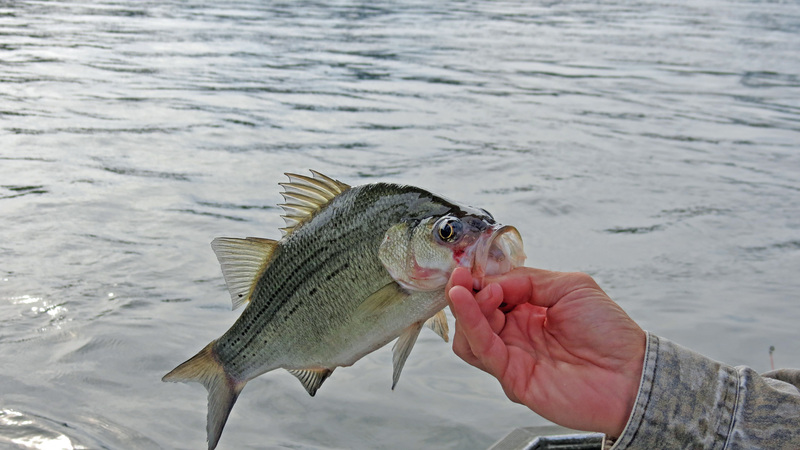 Perhaps more than any other species bass benefit from catch and release. Anglers like to weigh their catch but can also accurately estimate the weight. To do the latter, measure the length and girth. Then take the length times the girth. Divide that by 1200 and you get the weight. It is not good to just catch, unhook and toss a bass back into the water. As the water warms, they are likely to be on or near the spawn depending upon water temperature. Water temperature can vary significantly. The ideal temperature of the water habitat for the spawn is in the 60’s. Spawning bass are a resource that are useable but do not abuse them during the spawn. It is possible to catch bass during their mating. They are not difficult to aggravate into taking a lure presented in the general area of the nest. The smaller males aggressively protect the nest for the larger females. The key is to set the hook immediately as soon as you feel the bite. This keeps the fish from taking the hook deeply. It allows for hooking the lip preventing injury. Stress is the enemy of spawning fish. Once you hook the fish land and release it quickly to prevent exhaustion. If done correctly the sport of bass fishing presents no threat to the survival of the fishery. You can enjoy catching a lot of fish and still allow them to reproduce for the future of the sport.